This amazing image of the Northern Lights was a lucky shot for astrophotographer Manish Mamtani. 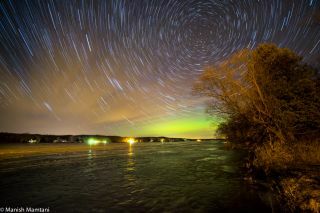 This amazing image of the northern lights was a lucky shot for an astrophotographer hoping for an awesome aurora view. Photographer Manish Mamtani took the image from Long Lake Recreation Area in Wisconsin on March 17 and recently shared the stunning view with Space.com.